With their victories last night on Big Brother 2014, it was a night of scrambling and trying to figure out who Derrick and Nicole will put up as nominees and the proper way to get Devin out this week on Big Brother 16! Derrick is one smart cookie and I have no doubt he will get Devin out this week, which is his mission. Check out the highlights from the Live Feeds last night below in our Big Brother 2014 spoilers! Brittany, the same person that was recruited by producers two weeks before the season started, was trying to tell Nicole, the BB fanatic who has watched every season, how to play game and to put Devin up to be fair and give him a chance to compete in the Battle of the Block and PoV…silly Brittany! Team America got their first mission, which has them trying to convince three HGs to start a rumor that a HG is related to a former Big Brother player. Hayden proposed to Nicole using a tin foil ring, but she did not accept. Don’t worry though because Frankie did say yes! However, Nicole did agree to some cuddle time with Hayden later on in the night, but then freaked out because she felt like she did something wrong! Now on to the talk of the night: nominees for Week 3! Derrick wants to backdoor Devin and know that getting him out this week will keep all blood off his hands since everyone wants him gone! He does not want Devin to compete in the Veto competition and has a plan to almost guarantee he goes home. Derrick plans to nominate Caleb and Jocasta while Nicole puts up Amber and the second is still being determined, but it could be Donny or Victoria. From there, Derrick has convinced Caleb to throw the Battle of the Block competition and that will take his queen off the block (and Donny if he is up there). Then Caleb will be able to compete in the PoV and win it just in case Devin gets picked to play in it. Then Caleb uses Veto on himself and Devin goes up as renom and buh bye Devin! To me, this sounds like a perfect plan, but I expect nothing but that from Derrick! He also told Cody and Zach to lay low this week and not ruffle feathers since the main target is Devin and they are safe and don’t need to cause drama. Cody then gave Amber a massage that had Caleb almost freaking out! Cody made it all better and smoothed things over with his bro. So, we should get nominees for Week 3 on Big Brother 2014 sometime today and then the Battle of the Block looks like it will be tonight, as it was being constructed and HGs were talking about it being today. An exciting Friday ahead of us everyone! The only problem i see with Derricks plan is that Caleb may not win POV. And if Devin is picked to play he might win it. So their plan would be destroyed. But they always have Caleb to oust instead. There are no guarantees in BB. But there are a few of them that think Caleb should go before Devin. The vote would be close unless Derrick can spread some of his Derrick dust. And since he’s good at spreading it, he may be able to do just that. Love that: “Derrick dust”!! I see the house’s reasoning, to be honest, but I think Caleb should be Plan B for Derrick since it means no blood on his hands – though he’d only really anger Caleb if that happened. Still, it would put Derrick on people’s radar much more than ousting Devin. I thought Devin and Caleb where on the outs now. They are but if you were Devin wouldn’t you want to score some points with Caleb? He has no alliance with anyone at this point and it would make Caleb look shady. He knows they all want Caleb out and it just might convince them that Caleb should go before him. Just trying to think of every possible scenario. We can only hope…… That planet thing took some thinking, and he won that. I just get nervous because MY wishes don’t usually take place on BB!! Wow. I can imagine Cat coming up with a plan like that, but that is just awe-inspiring BB thinking! Manages to walk the line between not offending anyone and getting out his target all at the same time. Bravo, Derrick. Never be the pawn. Hasn’t anyone got that one. The pawn almost always goes home. Ask Pow Pow. As long as Donny is safe I don’t care. Exactly! Never be the pawn. Yeah, I forgot to mention that if the plan backfires then Caleb goes home….Caleb is in his beast mode and thinks he could never lose and has to save his queen. I can not believe Caleb anyway. Getting mad because Cody gave Amber a massage. If she was his girl then she wouldn’t have let Cody do it. I want Cody to be with Nicole though. Oh well. Life at the BB house. It never goes the way I want it anyway. I typically do not get online during the show but love reading the comments the next day. Everyone on this site does such a great job. I just want to claim I was actually right about something this year so far (rare occurance). I did call the way Julie announced the HG leaving the house by playing the old trick of “Zach you are safe”. It would have been better if Frankie would have kept to himself. After what you wrote above Brittney just lost a lot in my book (was not much to start with). Derrick is slowly making himself one of the greats. I know it is early but I am thinking if he makes it far in the game and he keeps the same pace he could be viewed on the level of Dan, early Janelle or Dr Evil himself. I think he can play off a early HOH without raising alarms, thoughts. I hope the last nominee is not Donny. He has already been on the block; pull Victoria out of the background and make her play. The only downside to picking Victoria is she may whine enough to make the HG mad and move their focus off the target. But I am sure Derrick is thinking of that already. Yeah maybe they will sell Derrick Dust on the CBS website. I could use it on my boss when I want a raise or day off. Wouldn’t that be awesome. Yes!! I want some Derrick Dust too!!! If they do Cat should get a cut. Quick, trademark your concept! Derrick Dust for sale! Hey Mary, does Cat really have a bridge for sale…I could use one…Do you think she would give me a discount? I sympathise, my winter was like that as well. Nastiest ever! It depends. Where’s the bridge? I think i’m just paranoid that Devin won’t go home. The best plans of mice and men often go awry. Especially on BB. Yea, especially if we’re cheering for them out here! The only ones that seem to succeed are the ones we have to sit by, powerless to do anything (like last season)! Hey, what the heck is Donny up to?? Why would they put up Donny? He needs to stay in the house. And Caleb may not win POV and if Devin is picked picked he will win it. Devin needs to be the one going up as the replacement if they want him out of the house. And Devin needs to go. I like Caleb but bless his heart he needs to go home. Donny will come down when Caleb throw the BotB. Caleb is a mess. He needs to go soon before he gets too upset at someone that may look at Amber or touch her in a way he deems inappropriate. Caleb will be wanting Cody out the first chance he gets….if he gets one. Get rid of the competition. Caleb really is a mess. Poor thing is just a lover not a player of the game. He does need to go home. What is UP with all the BB live feed interruptions?!?! I know they’re about to do noms, but this is annoying!! 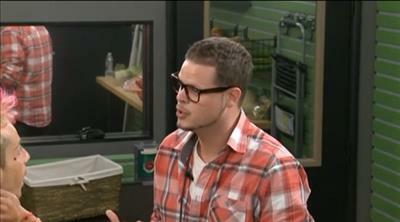 Donny, Nicole and Derrick have each said that Caleb should be evicted before Devin. I know Donny was serious but not sure about the other 2. Caleb as a pawn….yeah right! I’m a bit concerned that Derrick hasn’t worked quite as hard and nurturing the Nicole-Christine-Donny side of the house like he’s done the Zach-Cody-Hayden side. Donny is fixated on the 8-person alliance he and Nicole weren’t part of. One thing on our side is that Hayden is with Derrick, and Donny doesn’t realize Nicole and Christine are as close as they are. I’m thinking that Jacosta, Victoria, Caleb and Amber will be the noms. I hope so because i want Donny safe. I agree, but the whiney Victoria factor….. Ugh! Who cares….let her whine. Tell her if she whines all week she will be going home. Trouble is, not knowing how good…or bad….Jacosta and Victoria are in comps could be detrimental to the plan. Or Amber for that matter. I just sense something is going to go wrong. How could no one in that house not know how close Christine and Nicole are. He listens right. Yea, but he was trying to convince Nicole to put Christine up as a pawn today. If he know HOW close they were, he’d know that was NOT happenin. True but he should know that. They are always together. Christine is already under suspicion. They have noticed the closeness between her and Nicole. Along with Hayden. It won’t be long before they are on the block. I agree. Take out the ticking time bomb before the multiple personality. I think they need to get Devin out first. He is a hot mess and is nothing but a trouble maker. He needs to go home with a quickness. Then work on love sick Caleb. Devin is the much easier, no-blood-on-the-hands target. Caleb still thinks he’s in with half the house. He won’t take a “real” nomination very well! Well, thanks, BB…. Now I have to leave the computer for a few hours. Guess I’ll catch up with you all here at BBB when I get back! Thanks Cat. Fingers and toes are crossed that Donny will be safe. Caleb my first choice to go, Jacosta my second, Amber I don’t really care one way or the other. I wouldn’t mind if Amber was evicted. It would send Caleb into lunatic mode. Not that he’s not already there but i’d like to up the ante on his meltdown that would be sure to come. Did you get the newest blog? And TA has until midnight Monday to complete their mission.